Critics, historians, and listeners credit the arrival of Eldon Shamblin as a point of transformation in Bob’s music. Shamblin developed an instrumental style that was unique by combining a strong bass note with chord changes on virtually every beat, but his effect on the band’s music overall transcended his own playing. 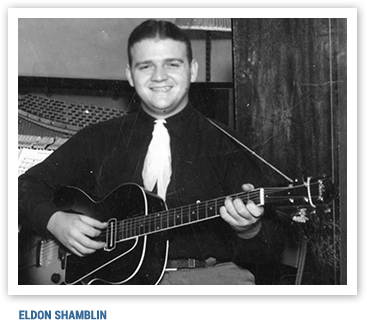 Like most of the Texas Playboys, he was largely self-taught, but he knew a great deal about the charts bands used in live performances and recording sessions. He was also a good teacher who could help other musicians develop the “head” arrangements most relied on to take a song from rehearsal quality to performance. With the exception of the horn players who had to have some help keeping the close harmonies of the “big-band” pieces straight, it is a virtual certainty that no one who ever played with Bob took a piece of sheet music onto a bandstand at one of Bob’s dances or shows. Bob demanded constant readiness, for one thing, so each musician would be able to play a solo at a split second’s notice. Bob also wanted the musicians in the band to engage the audience, and he knew that was impossible to do while studying a piece of music on a stand. That is not to say Bob abandoned the styles that helped make his live appearances so much fun. 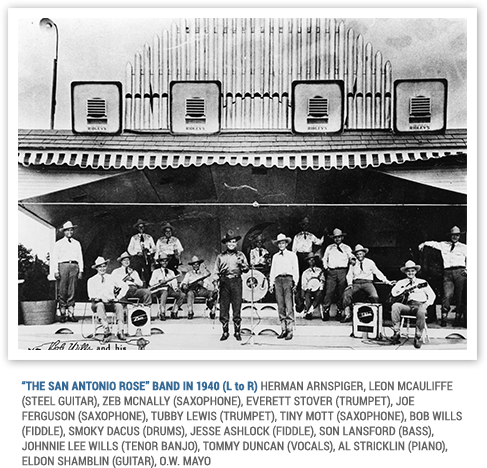 The April 1940 sessions that created two big band-style releases, “New San Antonio Rose” and “Big Beaver,” also produced recordings of fiddle tunes “Lone Star Rag,” “That Brownskin Gal,” and “Blue Bonnet Rag,” a medley of “Spanish” waltzes, “Corrine Corrina,” and an important song that foreshadowed Bob’s post-World War II influences on country music, “Time Changes Everything.” Eldon Shamblin’s influence was huge, though, as it pointed the way toward the future of Western Swing as a combination of genres and styles that demanded high professionalism. Everybody who ever played with Bob could play with anybody else who ever played with Bob, in part because of the skills Eldon Shamblin helped build into the band, including the ability to remember arrangements and pay attention to the highest standards of musical performance, while remaining constantly ready to improvise as Bob’s on-the-spot rearranging might require.